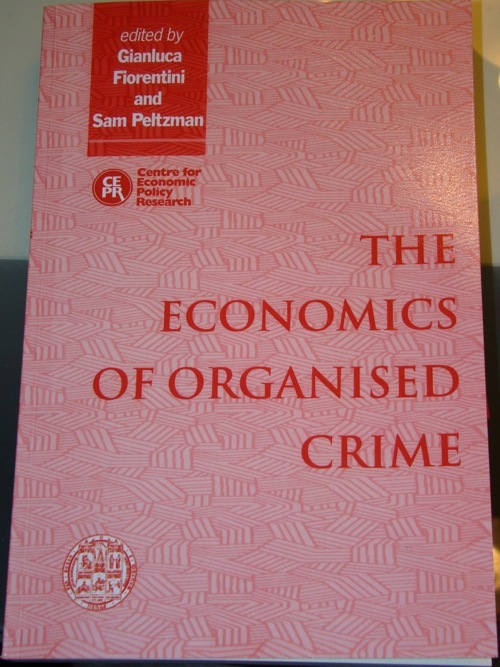 This book is a collection of different papers about organized crime. I try to summarize some of the main points. You can see organized crime as a state or a firm. There’s evidence for both analogies. It offers state functions. One is the provision of public goods, like defense and law enforcement. Furthermore, often its industries are regulated to make it harder for new competitors to enter the industry. Also, one goal is to extract rents from its protégées. And of course the monopoly over coercion. However, you can also look at organized crime as a firm or often better as a conglomerate. It’s mainly focused on the production side, e.g. the production of drugs or the trade of other things. Besides these activities, organized crime also act in semi-legal markets. One of the biggest income sources are collusions between the crime organization and the government. Mainly by using subsidies or securing public procurement projects. One author wrote that criminal organization often provide a framework for companies to form a cartel and then bid on public projects. The fixed price however will be higher than the market price. One paper stated that there’s no big public project where the mafia isn’t involved. The origin of organized crime is quite interesting. The most important actor is the state. Firstly, it defines illegal markets, i.e. provides opportunities for organized crime. Secondly, it misses its chances to coercive in areas, e.g. slums where other coercive organizations overtake the monopoly of force. Lastly, see above, it provides possibilities for rent extraction with subsidies and public interventions. If we talk about the origin, we can also talk about the termination. Interesting enough, if markets are legalized, mafias don’t look for new business opportunities but mostly change into legal markets. Especially in families it’s outstanding how the career of the youngest generation changes from crime to legal activities. The organizational form as a family has some nice characteristics. Firstly, it provides better control over the members which are one of the biggest source of danger for a criminal organization. This leads to high costs of exposure, i.e. high transaction costs which leads to smaller criminal organizations. Sometimes, they include outsiders to the organization but require investments like murder up front. Besides illegal markets and public contracts, organized crime can also work in legitimate industries. Mostly, it helps to achieve oligopolies or does organized customer acquisition. One example are ferries where members of the mafia provide each ferry company a quota of customers. In other highly competitive markets with low entry barriers, the mafia does the same thing, e.g. transportation, restaurants, etc. One interesting aspect of mafia involvement is that firms in this industry accept that they have to pay the mafia, so that its business runs smoothly. Generally, corruption happens more often when the distance between relationship is smaller. Especially in parts in south Italy this is prevalent. Relationships also become more important if people have great power. So you can expect more corruption with local politicians in small towns than let’s say with corner store owners in NYC. In conclusion, I really liked the book besides of some papers which were just theoretical models and probably aimed at theoretical researchers. Otherwise, it delivers a great introduction in the economics of organized crime and is readable for people with basic economics knowledge, i.e. Econ 101, e.g. Mankiw’s Principles of Economics.